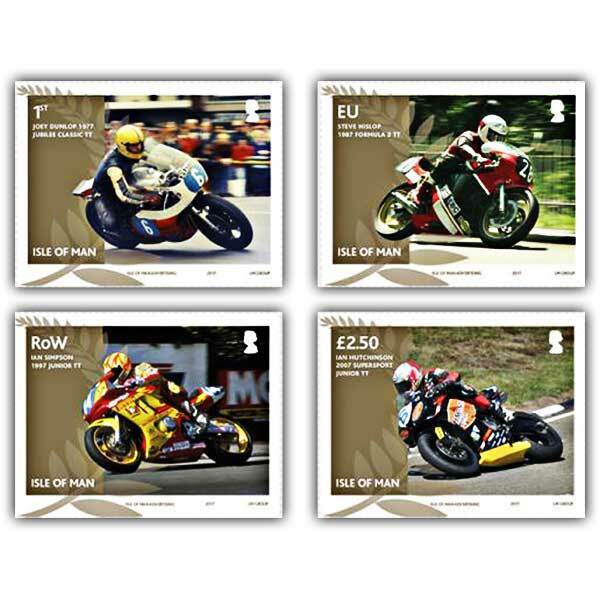 Feel the thrill of the Isle of Man TT races with this set of four stamps showing Joey Dunlop, Steve Hislop, Ian Simpson and Ian Hutchinson's in action during their first Isle of Man TT winning race. With delicate gold detailing highlighting their achievements along with the famous winner's laurel wreath. The TT's present most successful racer, with 26 wins, Joey Dunlop took his first win at the 1977 Jubilee Classic TT despite an engine misfire and needing to stop to check the state of his rear tire. Steve Hislop raced to his very first win a decade after Dunlop, winning the 1987 Formula 2 TT, getting rid of stiff opposition and ignition problems along the way in exactly what would be the very first of 11 TT wins. Following in his dad's TT winning ways, Ian Simpson secured his very first success in the 1997 Junior race. Fan favourite Ian Hutchinson, took his debut win in the TT's centenary year, when he was victorious in the Supersport race. 10 years later Hutchinson has 14 TT wins to his name! Another addition to my collection and yet again the service, price, speed of delivery and quality of the items are all of the highest order. Already looking forward to the next editions being released.